This gorgeous boho style cocktail shaker will add a glamorous look to your home bar set up. 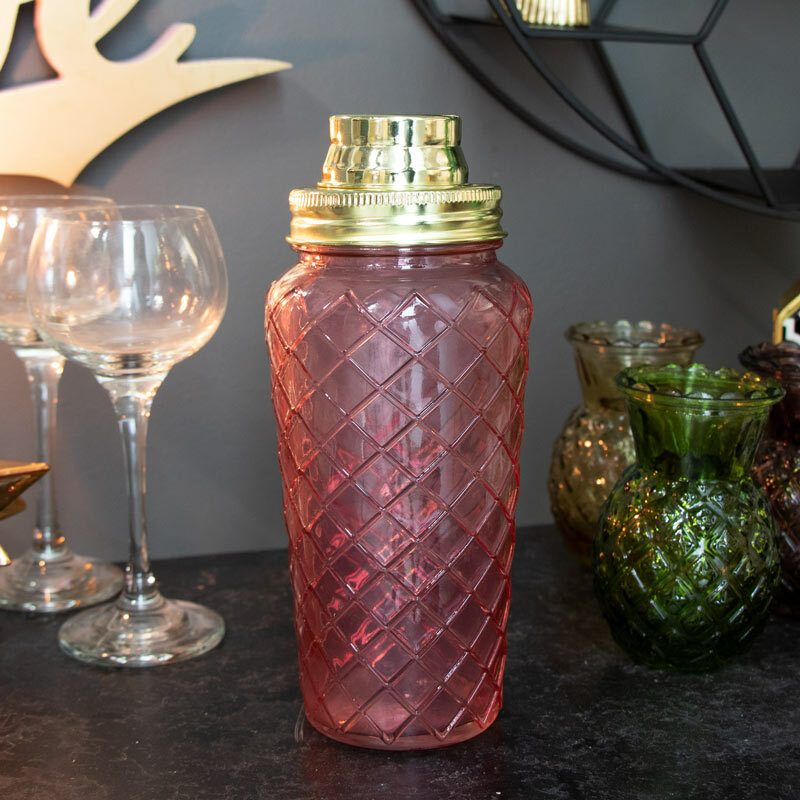 Exquisite pink bottle with a gold lid for that boudoir vibe. Complete your home bar with this pink cocktail shaker. Decorated with embossed diamond detailing on the glass and topped with a gold lid. This is perfect for the home bar or a club, pub, restaurant or wine bar. Mix up martinis, cosmopolitans and margaritas like a pro. This would make a great gift idea for the drinks connoisseur and expert cocktail maker. This gorgeous boho style cocktail shaker will add a glamorous look to your home bar set up. 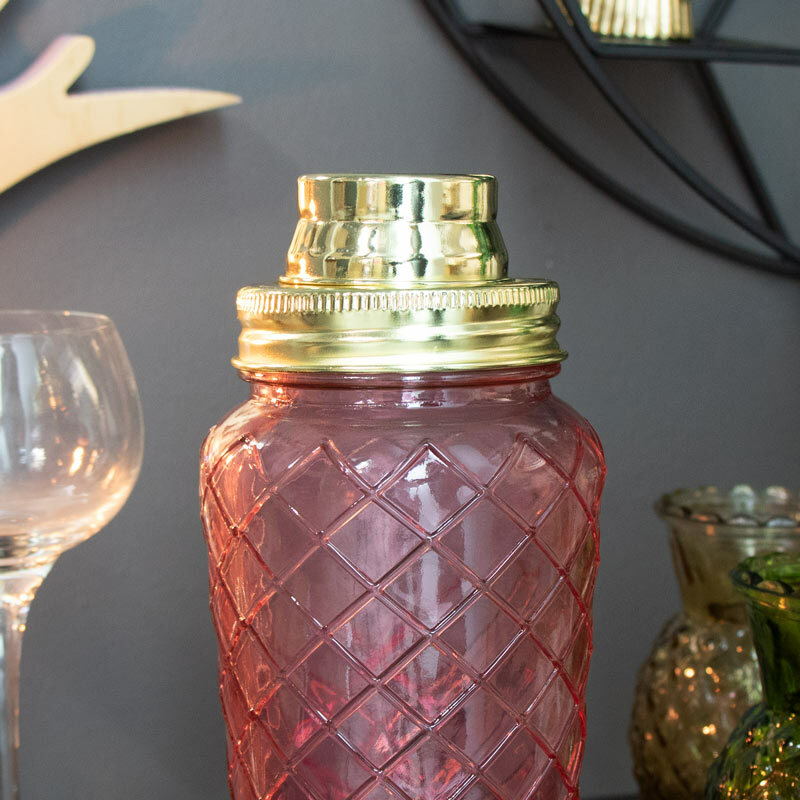 Exquisite pink bottle with a gold lid for that boudoir vibe. Complete your home bar with this pink cocktail shaker. Decorated with embossed diamond detailing on the glass and topped with a gold lid. This is perfect for the home bar or a club, pub, restaurant or wine bar. Mix up martinis, cosmopolitans and margaritas like a pro. This would make a great gift idea for the drinks connoisseur and expert cocktail maker. Made with glass with diamond cut embossed patterning and gold metal top and cap. (Please Note: this is not dishwasher or microwave safe). A fantastic addition to our extensive range of gifts and home accessories.